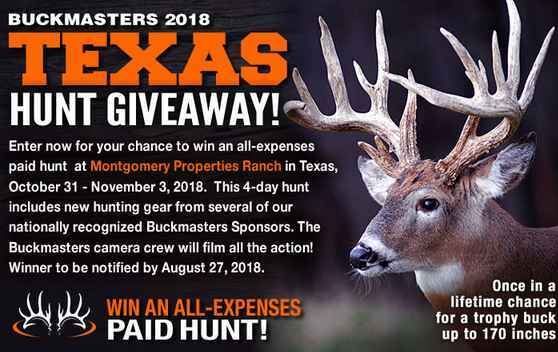 Enter the Buckmasters Texas Hunt Giveaway Contest right now for your chance to win all expenses 4-Day hunt in Texas with Montgomery Properties Ranch in Texas. This 4 Days Hunt includes: Room and Board, All travel arranged and paid for by Buckmasters, Savage rifle, Scentlok clothes, Nikon scope, Federal Premium ammunition. How To Enter: Go to this link:buckmasters.com/Contests during the contest period and follow the online instructions to register by entering all information requested on the registration form and once you filled out the entry form now Click on the submit button to complete the registration form. Prizes: One grand prize winner will win a 4-Day hunt in Texas with Montgomery Properties Ranch in Texas. This 4 Day Hunt includes: Room and Board, All travel arranged and paid for by Buckmasters, Savage rifle, Scentlok clothes, Nikon scope, Federal Premium ammunition. Who Can Enter: This Contest is open only to legal residents of the fifty (50) United States and District of Columbia who are eighteen (18) years of age or older at the time they enter the contest. When To Enter: The Sweepstakes entry begins on July 23, 2018 and end on Aug 26, 2018. Who’s Sponsor: The Buckmasters.com Texas Hunt Giveaway is sponsored by Buckmasters, Ltd., 10350 Highway 80 East, Montgomery, AL 36117.